Is Danny still sulking in there somewhere or did he rage quit already? Well, thanks for the tribute :) I definitely laughed out loud. I think what really sells it is the glare. Of course he lost, dude probably spent all his money trying to impress a girl then had to sell off everything he had so he could afford to stay one night in a pricey hotel with nothing to show for it. Danny’s probably off taking one of those cold falling water things. Methinks that he’s at the foot of the porcelain god, giving alms to King Raaalph. First? No first comment, and of all webcomics I read, this is by far my favorite! Keep up the good work! It is awesome! I just am so exited on the days these go out, and I look desperately for the new ones! I think that Shotgun Shuffle > Cyanide and Happyness! Coming down from the sugar high might make him black out. Well, Pumpkin, fighting patriarchy generally doesn’t pay well, especially given that no one’s exactly sure where to send the bills. They’re going for a magikarp-et ride? Now that is one fishy pun. Sorry Rusche, but I like Banena’s version better. 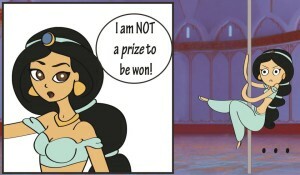 Something about Jasmine’s face in panel two. 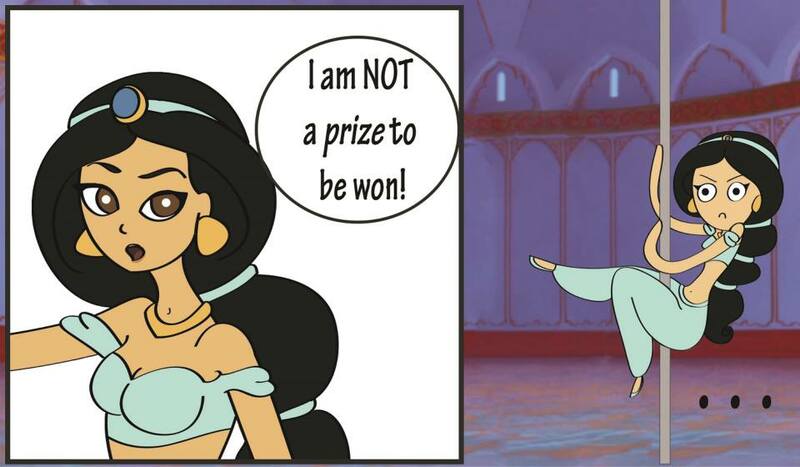 jasmine is an independent woman who don’t need no man! I agree, the look of smoldering contempt really sells it. Coulda been worse. Danny might have had to fall asleep to the sounds of an Olsen Twins movie bleeding in from the next room. That’s a scary image, Gravatarless. You’re thinking of The Shining. So, is this from a musical, or something? I’m not getting it. My guess is that they’ve discovered pay-per-view. I am also in the “don’t get why this is funny” camp. This strip is less about trying to be ‘funny,’ and more just an observation. Jasmine doesn’t want to be controlled, confined, and generally treated like an object or possession. That’s what makes her such a great character with memorable lines and scenes. But then Disney took her wardrobe design and went more stripper than “style of the time.” Granted, the later scene was mostly Jafar perving on her, but her red wardrobe can also be included in the “what were they thinking” column. 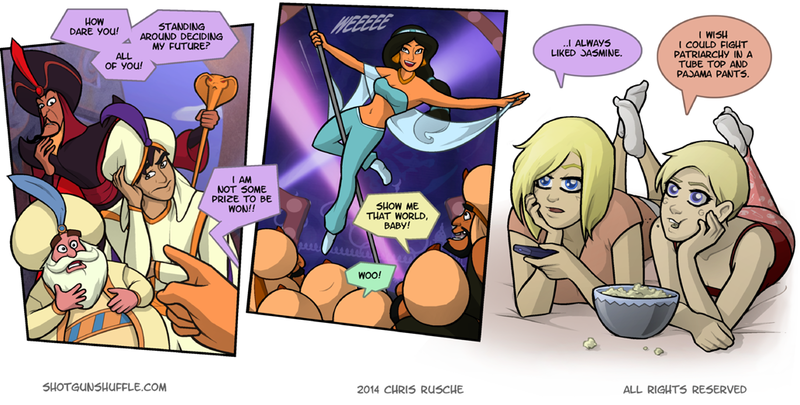 That could be Jafar objectifying her, yeahhhh… that makes sense… but it’s still a parallel of what she normally wears, and what she normally wears, is what Disney dressed her in. So there’s a bit of a mixed message in Jasmine’s presentation… overall. And because I forgot to mention it earlier, great job on the art. The first panel in particular looks like it could be a screen grab from the film. I don’t think it’s unreasonable for a woman to want to look attractive and to also want to be treated like a person. Treating the two as contradictory has tones of blaming the victim. That little “weeeeee” just makes it a LOT more funny! So this must be in the special edition? If this is how they get updated we need to pick up these Disney movies more often. Oh, please, Nelson…stop acting like you’re surprised by the little pervert. You programmed him, after all. I’ve been a bad influence on him. Oh no, the guy who was here before me and escaped using the shuttle hidden in the crate of hamdingers programmed these two. Do you have any idea how many crates of hamdingers I’ve tried to get up here to get another escape shuttle? Oh…yes…the janitor we sent up first…. Wait, why am I making a distinction between the janitor and the temp who replaced him? All I do is send up the movies! Get back in the theater, you collective heads of knuckle! Wait, what’s the janitor doing up there with the other one? Frank! Get in here! I think something’s gone wrong in the timestream inversion department again! …LAR?? But…but…you were eaten by a giant spider! I raised that spider from birth myself with a taste for human flesh and…uh…what I mean is, it was a terrible accident. Yes. Terrible accident. Now I KNOW something’s gone wrong in temporal mechanics. That’s the last time I hire anything with an address of “Borg Collective.” FRANK! GET IN HERE! BRING THE…OTGUN-SHAY! What makes this funnier to me is that on Monday, my wife wanted to watch Aladdin. I spent the entire movie laughing to myself, especially when the scene depicted happened. Good stuff, and good times. That had to be fun.